This post is for comments on classes about the performance of Angels in America. As many of the actors stated, the characters in the show undergo many transformations and changes. Some go on such a character arc that by the end, they experience a catharsis or cleansing/purification. Choose one character in the show whose actions you may or may not agree. How are their actions in the play justified? What changes would you make to the conclusion of their story if you were the playwright? Why? Choose one technical element that stood out to you in the performance. How did this element enhance the narrative story of these characters and these themes? What way would you re-design this element in any particular moment of the show? Throughout the production, we see theatrical elements that draw us to the fact that this is a play or theatrical performance. These aspects that remind us this is drama or a performance make Angels in America into a work of metatheatre. Name three aspects of metatheatre evident in this production. Why do you think Tony Kushner chose to frame this play with metatheatricality? Which character resonated the most with you as a person? Why? This production featured an ensemble cast with many scenes jumping between storylines and interweaving their tales. Which actor would you evaluate as the best performance in the production? What details about their performance support this view? 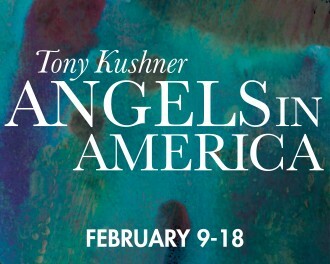 Angels in America by Tony Kushner is a Pulitzer Prize winning play. Why do you think the playwright chose the title Angels in America? How is this title significant to the story? The AIDS quilt panels on display at the performance are only a small sampling of the over 48,000 3' x 6' panels in existence. Read more about the Names Project at http://www.aidsquilt.org/about/the-aids-memorial-quilt How did the display of the quilt aid in your viewing of Angels in America? This post opened at 8:30am on Friday morning. This post will close on Wednesday, February 21 at 11:59pm.